Look at the 15-year Fixed-Rate Worksheet and consider the ramification of this decision. As you can see in this worksheet, the buyer agrees to a purchase price of $235,000 and makes a down payment of 20 percent, which means the amount he is financing is $188,000. If he had chosen a 30-year fixed rate, his payment would be $1,158 per month, excluding homeowners insurance and real estate taxes. 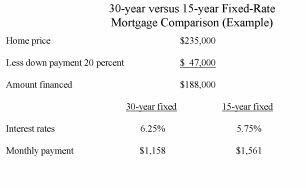 However, by choosing a 15-year fixed rate, he obtains a lower interest rate but a much higher payment. By choosing a 15-year fixed rate, this buyer obtains a lower interest rate but a much higher payment. If you have ample and stable cash flow, plenty of cash reserves, and don’t like the idea of having long-term mortgage debt, go with the 15-year mortgage. However, this is not the case for most people. The difference in payment — approximately a third more for the 15-year mortgage than for the 30-year mortgage — isn’t a commitment that many people should take on. By going with a 30-year fixed rate, the monthly payments are much more manageable for most people. However, should you choose to accelerate the repayment of your mortgage, you can retain the utmost flexibility while still knocking years off your mortgage payments by simply adding an additional $100 per month to your mortgage payment. Of course, the more you can afford to pay, the better, because you’ll pay off your mortgage faster and save a lot on interest. If you pay more than your monthly payment, be sure to clearly specify to your mortgage company that the additional dollars are to be applied against the principal balance of your mortgage; otherwise, they won’t be. You may have heard of biweekly mortgages. This concept has a lot of merit. However, you shouldn’t have to pay extra for this service. You can create your own biweekly mortgage by submitting one half of your monthly mortgage payment every other week in advance of when it’s due. At the end of the year, you’ll have made 26 biweekly payments — the equivalent of 13 monthly payments in a year. This simple strategy knocks about six years off the term of the 30-year mortgage and saves you tens of thousands of dollars in interest over the life of your mortgage.